Physical Description: Pill Bugs have fourteen legs and twenty protective plates that run the length of its body. 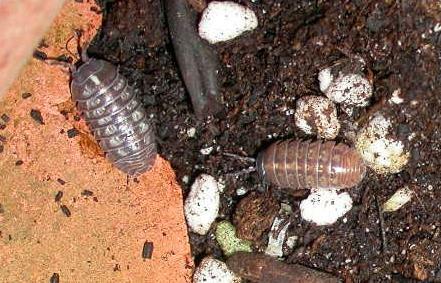 The difference between Sow and Pill bugs is the latter rolls up into a ball when disturbed. The habits and controls are the same. Feeding characteristics: These bugs breathe by gills, and are restricted to damp environments, often under rocks or decaying vegetation. Their principle food is decaying organic matter, and rarely a demanding problem. They may occasionally nibble on young tender plants and Strawberries if populations are high. Controls: Controls are usually unnecessary, but if large numbers are causing problems, first try clearing the area of debris. Oak leaf mulching material and wood ashes worked into the soil or a weak solution of lime (from limestone) in water (let stand for twenty-four hours) will repel Sow and Pill bugs. To prevent Sow and pill bugs from taking over the compost pile turn the compost frequently to increase the temperatures. For severe problems use tobacco dust or pyrethrum as only a last resort.